The RHP® Nerve Support Formula contains highly bio-available Methylcobalamin (vitamin B12) and Benfotiamine (vitamin B1). 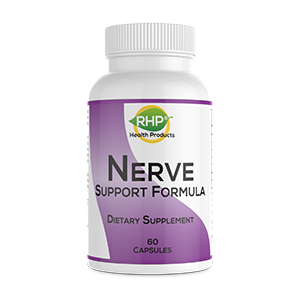 The RHP® Nerve Support Formula is specifically formulated to help you build healthy nerves. Healthy nerves shouldn't burn, feel cold, tingle, feel numb or cause pain in the feet, legs, hands or arms. Also, included in the RHP® Nerve Support Formula are small amounts of riboflavin (vitamin B2), vitamin B6, and Folic Acid. These vitamins are cofactors (substances that must join with another to produce a given result) of vitamin B12. The RHP® Nerve Support Formula provides these important B vitamins in sufficient dosage to provide your body the nutritional support it needs to get relief. A bottle containing 60 capsules is $44.20. The RHP® Nerve Support Formula is manufactured in the USA in a facility certified with an A rating under the Natural Products Association Good Manufacturing Practices (NPA GMP) program since 2001 and a National Sanitation Foundation (NSF) GMP Registration since 2004. This ensures the product produced has the identity, composition, purity and potency it is represented to possess. As part of your purchase, you can contact a Product Consultant at any time about any questions regarding the use of the RHP® Nerve Support Formula and how to get the best results. Order the RHP® Nerve Support Formula and experience the results for yourself. "Nerve Support Formula has greatly helped me. I started taking it and almost immediately noticed an improvement. "This is an excellent product, which I would highly recommend. I also greatly appreciated the assistance of the staff, they were very helpful and continually monitored my progress." “I am really amazed at the improvement in my feet as the result of taking this product. I can tell on a daily basis that my feet are getting better and healthier. "I have been very pleased with it so far! The nerves in my hands and feet are healthier and have almost no pain. Since starting this formula I have a tremendous amount of energy and feel great. My wife, kids and friends have noticed the difference. I referred several people to your website already. "I just recommended your product to an associate last month. "I took your Nerve Support Formula daily. My nerves in my fingertips don’t hurt and don’t feel 'sensitized' and they are healthy. I couldn't be happier. "ANYTIME I hear people talking about their nerves, I recommend your product and send them to your website. Thanks again." "Thanks again for helping my nerves and my fingers. Shortly after starting your product, I felt a great improvement in them. I could do up zippers and buttons again. You really have changed my life! All I can say is, anyone who wants to have healthy hands, fingers and feet, with no problems, please try this product. IT WORKS!" The RHP® Nerve Support Formula is a nutritional supplement which has been on the market for over ten years and it is the most successful product we offer. 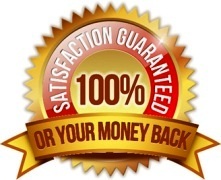 We're so sure about the quality and effectiveness of the RHP® Nerve Support Formula, and that you will experience the life changing results, that we offer a 90-day money-back guarantee. Order the RHP® Nerve Support Formula Today!